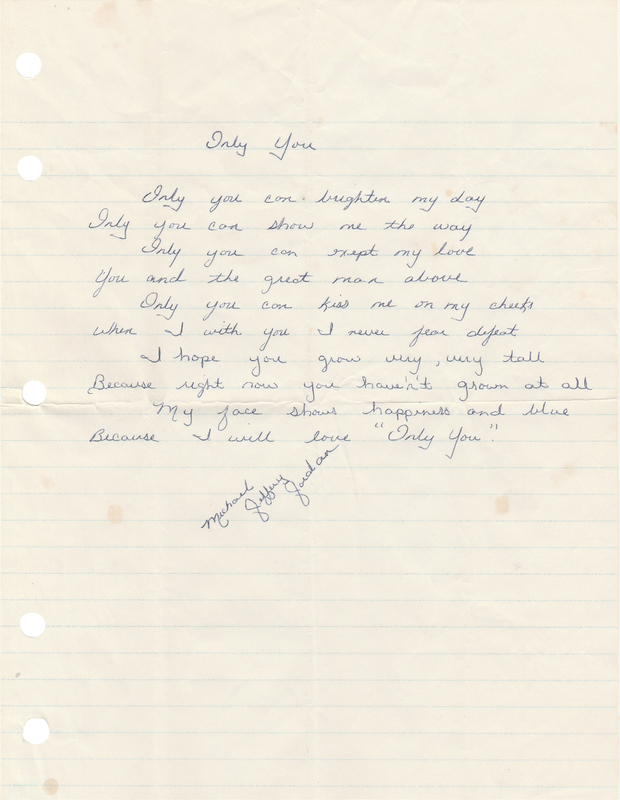 Lot Detail - Michael Jeffrey Jordan Signed Handwritten Love Poem Titled "Only You" (JSA)- One of the Earliest Known Signatures of Jordan! 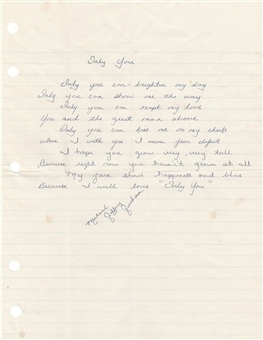 Michael Jeffrey Jordan Signed Handwritten Love Poem Titled "Only You" (JSA)- One of the Earliest Known Signatures of Jordan! It's easy to imagine the scene as a middle-school or early-high-school age Michael sits at his desk composing these romantic lines, then formally signs his name, "Michael Jeffrey Jordan," folds the page up to pocket size, and hands it off to the girl of his dreams. Titled "Only You," the poem is by turns sentimental ("Only you can kiss me on my cheeks"), devout (mentioning "the great man above") and, well, awkward ("I hope you grow very, very tall / Because right now you haven't grown at all"). But the standout phrase by far—and the one which foretells His Airness's unparalleled hoops future—remains, "I never fear defeat." While not quite the quality of Robert Frost or John Keats, you certainly sense the passion that Jordan exudes, the same passion which allowed him to dominate on the hardwood. This poem is written on standard lined loose leaf paper, which is slightly toned and contains a few small stains, none of which hamper the poem. There are several folds, looking like it was carefully folded and presented to its original esteemed recipient. 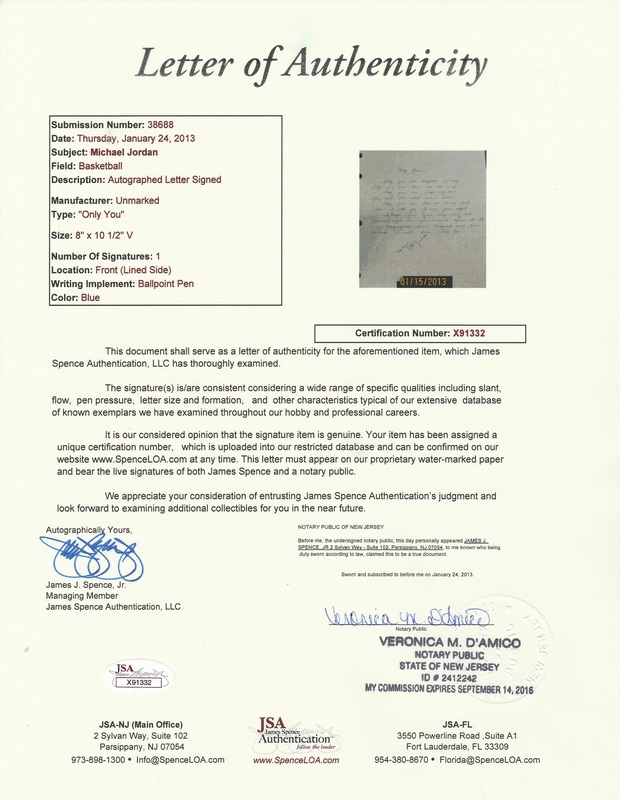 The signature is a rare full name example and one of the earliest examples known of Jordan's autograph. This extremely rare one-of-a-kind item comes with a full LOA from James Spence Authentication (X91332).